Discussion in 'iPad Accessories for iPAD 1, 2 and 3' started by xune, Jan 8, 2011. Similar in function to AirStash, the newly announced Kingston "Mobi SX" is a WEP-secured wireless storage device that allows up to three people to store and then stream media files. The MobiSX was shown off to a lucky few behind closed doors at CES in Las Vegas yesterday – essentially they’ve have created a flash storage drive with Wi-Fi built in so you can hook it up to all your Apple gizmos. All you have to do it fire up your iPad, go to your Safari browser, tap in its IP address and you’ll be greeted with a file manager. From there you’ll be able access documents, photos, movies and music. 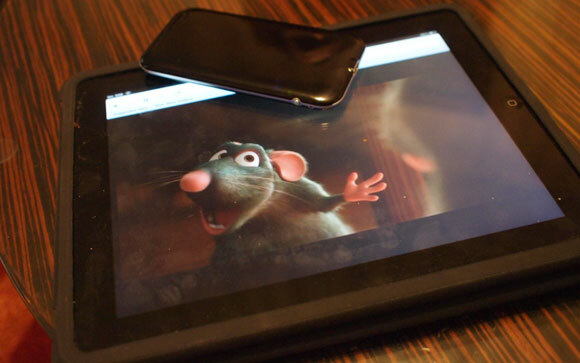 According to early reports, movies streamed direct from the MobiSX take just a couple of seconds to spring to life on the iPad’s screen, and up to three people can stream from a MobiSX simultaneously. Battery life tops out at four hours constant streaming, or six in standby waiting for iPads, iPhones, iPod touches or laptops to connect. What were looking at here is the first way to relieve storage anxiety as you won’t ever run out of space, and this is becoming more and more of a problem, especially with the inflating size of apps that are hitting the app store recently – we recently installed FIFA 11 on our iPad to be shocked that it was over a 1 gig. And the icing on the wireless cake: Kingston has stated that this space saving solution will set you back $100 for a 16GB model, allowing you to double the space of the smalled iPad without having to remortgage your house. I will definitely be getting this or the AirStash when they are available. Am I correct in my assessment that these devices only allow you to play files from the device to the iPad and they do not let you store files from the iPad to the device? Currently, yes on the AirStash. By the end of the month, Wearable Inc. will supposedly offer an upgrade that will let WebDAV-compatible software like QuickOffice to save files to the AirStash in the same way they let you save to DropBox and MobileMe. To all those who say Ipad has no expandable memory...I offer this article and post.